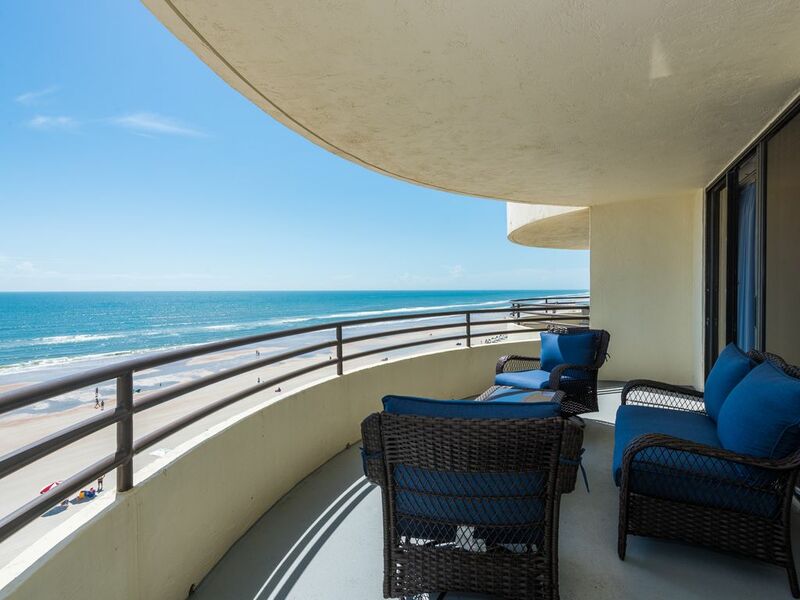 This gorgeous 5th floor condo located in Sand Dollar Condominiums has beautiful views of the beach and ocean as far as the eye can see! The views extend from pier to pier and beyond. Watch the dolphins play and the pelicans fly right by. You enter the expansive balcony from both the living room and the master bedroom. Both bedrooms offer brand new Memory Foam mattresses (king and queen). The brand new couch offers a full size pull out bed. There is Wifi in the condo as well as poolside. The condo offers comfortable furnishings and new coastal decor. All bedding is brand new, as well as new pots and pans and bakeware. There is a reserved parking space in the underground parking garage. One additional parking space may be available on the main level parking lot and this is first-come first-serve. This additional parking pass is available through the community manager. Many restaurants and places of interest are nearby, including Daytona Speedway and Ponce Inlet Lighthouse. Disney, Universal and Sea World are within a 90 minute drive. Publix and Walgreens are walking distance from condo, as well as several restaurants. Mini golf and shopping are close by. Come and have a memorable, fun-filled time at Beach Dreams condo! There are 2 bathrooms, one is in the master bedroom and one has access from the hallway as well as from the guest bedroom. We loved the unit, especially the ocean view from the huge balcony. We do a lot of cooking and appreciated that the kitchen was spotless and equipped with everything we needed. The pool and whirlpool were really nice too. Doug is easy to communicate with. If we return to the area, we will certainly stay at Doug & Lori’s place again. We had a wonderful time right on the ocean, saw a whale with calf and dolphins. The condo was very clean and beautifully decorated in a beach vibe. Sunrises from the spacious balcony. A heated pool in the sun all day and a hot tub. A small exercise room, underground parking. It was close to activities, restaurants, groceries, etc, So easy to deal with Doug, there was a dryer/ washer issue, which he solved immediately with a new washer and dryer. We were given a warm, personal greeting and tour from Doug when we arrived., A wonderful place to spend time away from the cold! A very welcoming and attentive owner.! We enjoyed the month we spent in Daytona. The condo is comfortable and the building is managed well. I especially appreciated the indoor parking garage and the view from the balcony. Lots to do and see in and near Daytona, great restaurants (not the ones across the street) but you need a car. We come to the Daytona area quite often and have rented several condos on the beach. great. Looking forward to coming again. Great place to relax and enjoy the beach . Doug and Lorri were exceptionally gracious.The little touches like cold drinks at arrival, books, local magazines made it very nice. Doug personally met us, showed us around the building and unit and have some local points of interest to visit or eat out at. We will definitely be renting with them again when we get the chance to go to Biketoberfest again.